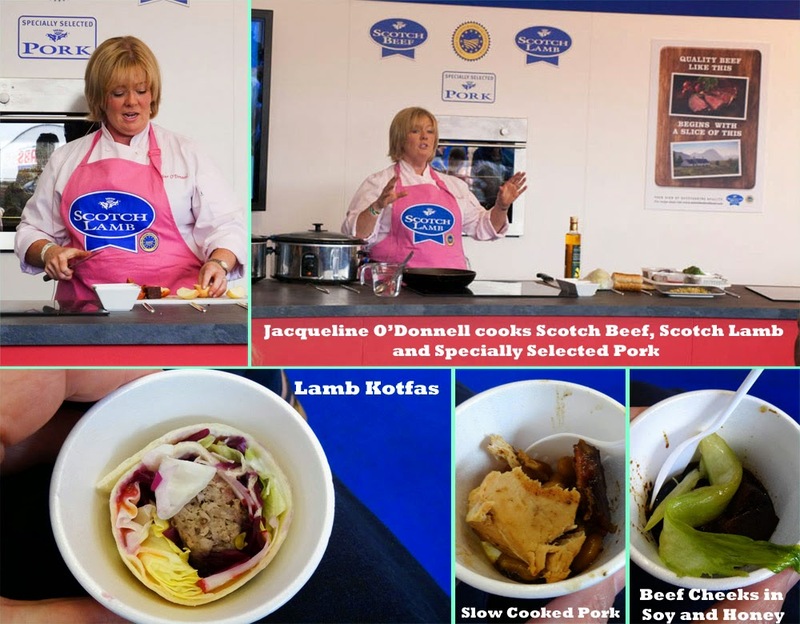 I was delighted to be invited to the Royal Highland Show of Scotland by Quality Meat Scotland (QMS) and particularly to meet Jacqueline O'Donnell, Chef Patron of the Sisters Restaurants in the West End of Glasgow and winner of the Scottish round of the The Great British Menu 2014 but more about that later. I arrived early to avoid any queues of traffic and first made my way to the Food Hall to meet up with the lovely Claire and her team at Mackays Jams for a foodie catch up. 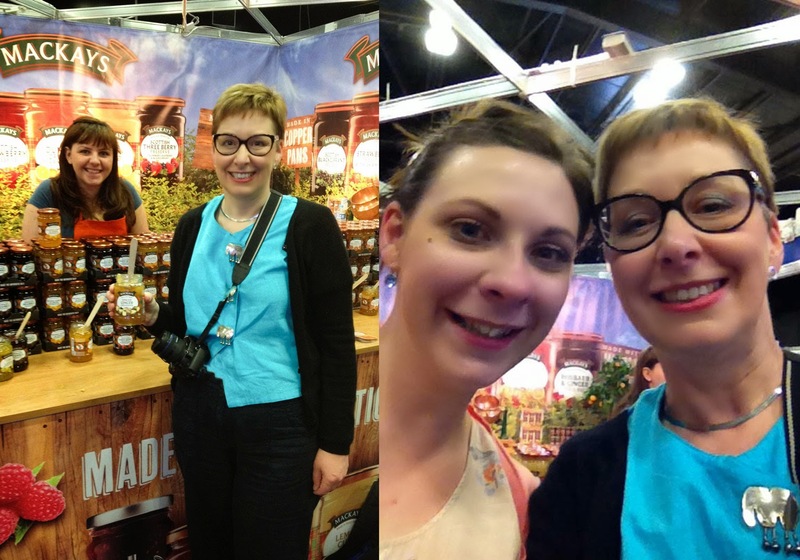 Then I went for a bit of a walk around the show, here are a few photos from my walkabout, including a selfie with mini versions of the, now famous, Kelpies sculptures. 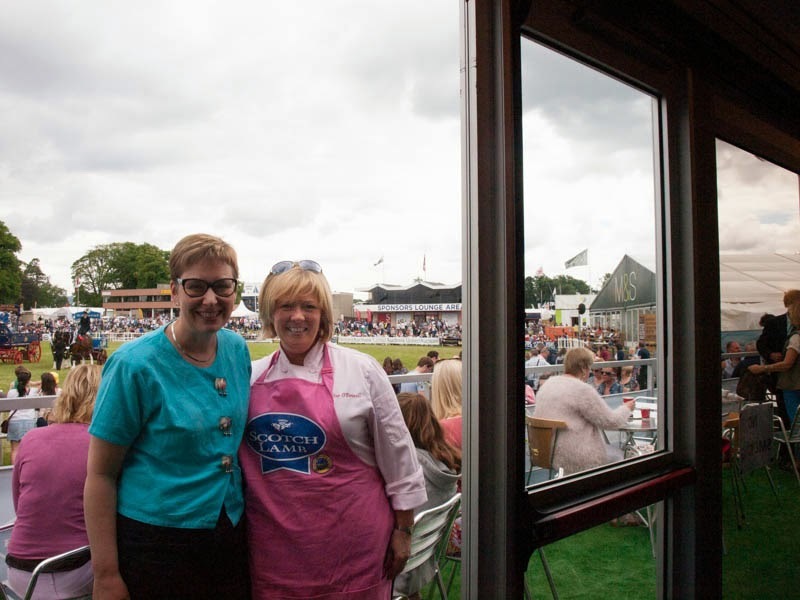 It was soon time to head to the Quality Meat Scotland marquee where I met up with Margaret. Margaret has worked for QMS for many years and, with a combination of a farming heritage and catering experience, Margaret was the ideal guide to the RHS. We started with a tour of the different breeds of sheep. 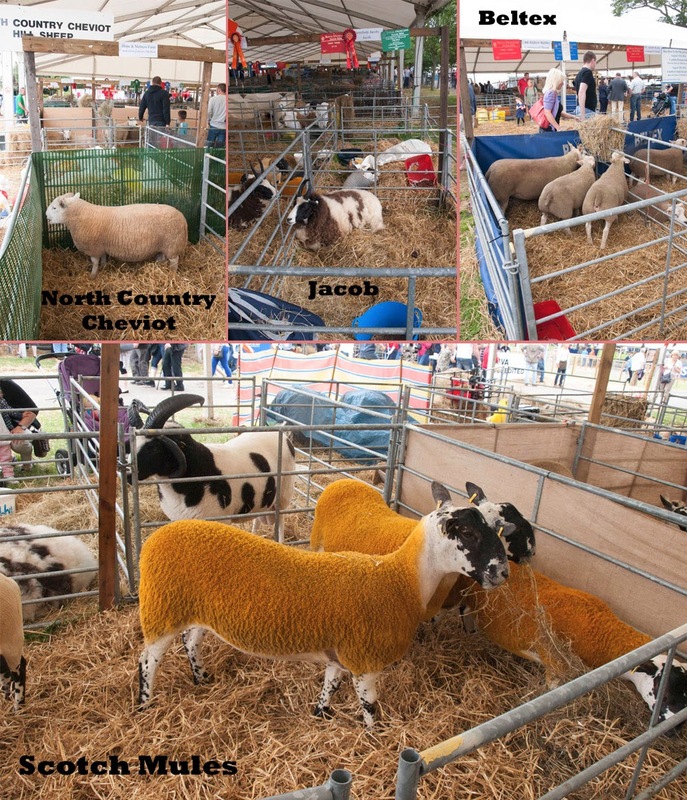 I know a bit about cattle breeds, but very little about sheep, so found it fascinating to find out about the way the different breeds of sheep are matched to the land. The Hebridean sheep, for example is a small sheep which helps it to survive in the demanding climate of the hebridean islands. It also has a tough wiry fleece to withstand the elements. You can read more about the different breeds of sheep on the Scotch Beef and Lamb website. The one breed I didn't get a good photograph of is the Blackface Sheep, which is ironic as it is the most numerous breed in Scotland! If you'd like to see some great photographs of Blackies in their natural habitat head over to the Blackface Sheep Breeder's Association. 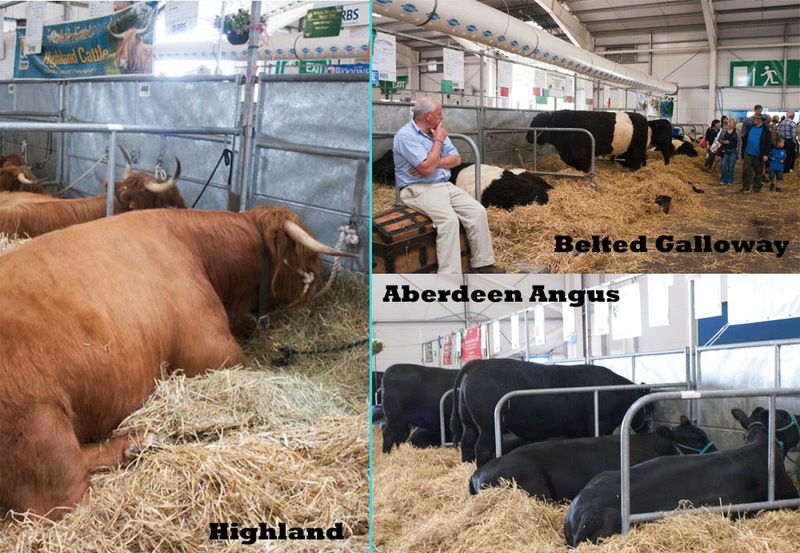 We then took a tour of the beautifully appointed cattle shed, where the best of the best of Scottish cattle were calmly standing or lying. There were many other breeds but these three are so typically Scottish that I wanted to feature them. Margaret and I then took a quick look into the Food Hall and she introduced me to Jock Gibson, Manager of Macbeth's Traditional Butcher and Game Dealer from Forres in Moray. 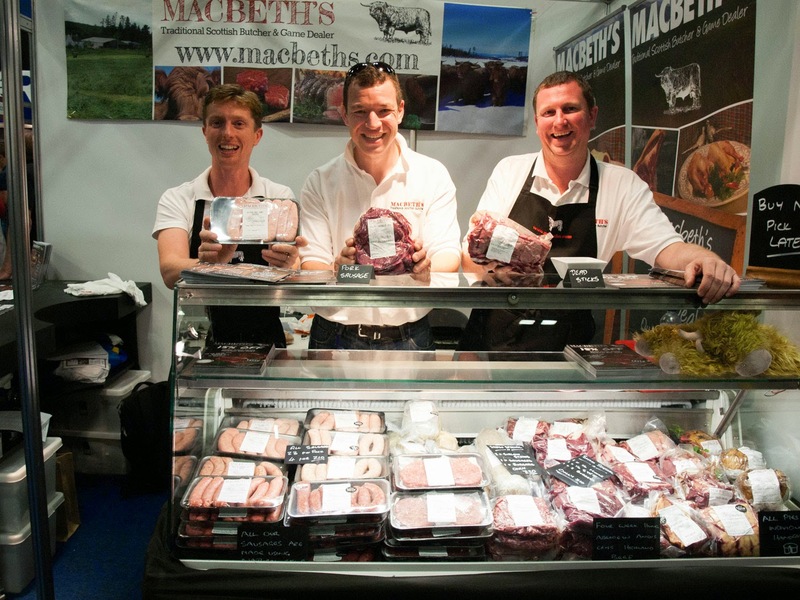 Macbeth's is a family run business with the Scotch Beef they sell coming from their own upland farm where they rear traditional Scottish breeds in traditional ways. 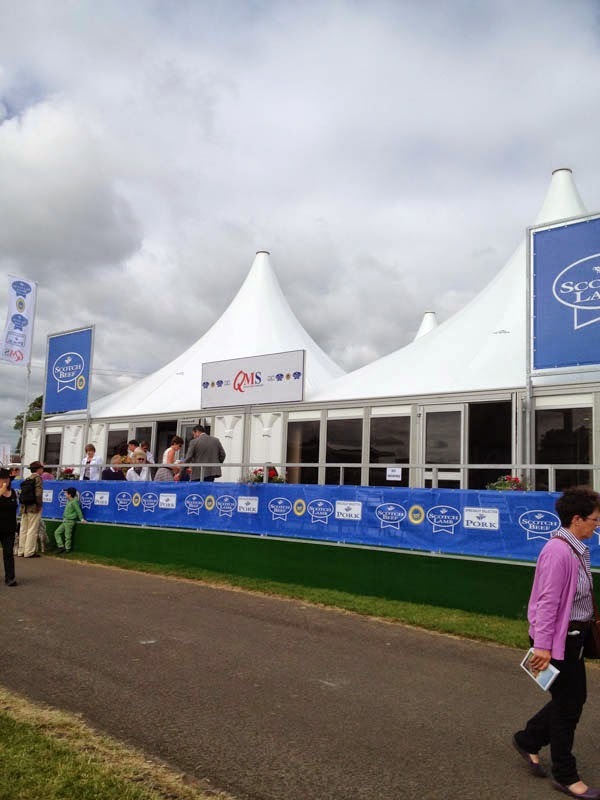 Then it was back to the QMS marquee for some lunch and a chance to find out more about Scotch Beef and Scotch Lamb. So just what defines Scotch Beef and Scotch Lamb? It's really quite simple, the 'Scotch Beef' and 'Scotch Lamb' labels have Protected Geographical Indication (PGI) status (like Cornish Pasties, Melton Mowbray Pies and Yorkshire Wenslydale Cheese) this means that products with this label are derived from cattle or sheep born, reared throughout their lives, slaughtered and dressed in Scotland. This is quality assured by Quality Meat Scotland (QMS). Scottish Beef and Lamb may have been raised in Scotland but not born there so be sure to look out for the 'Scotch' label to be assured of quality produce. Just as an aside, and nothing to do with my visit to the Highland Show, the beef from our farm is quality assured by QMS as Scotch Beef. If you would like to find out more about the checks which are carried out then read about Cattle and Sheep Standards on the QMS website. 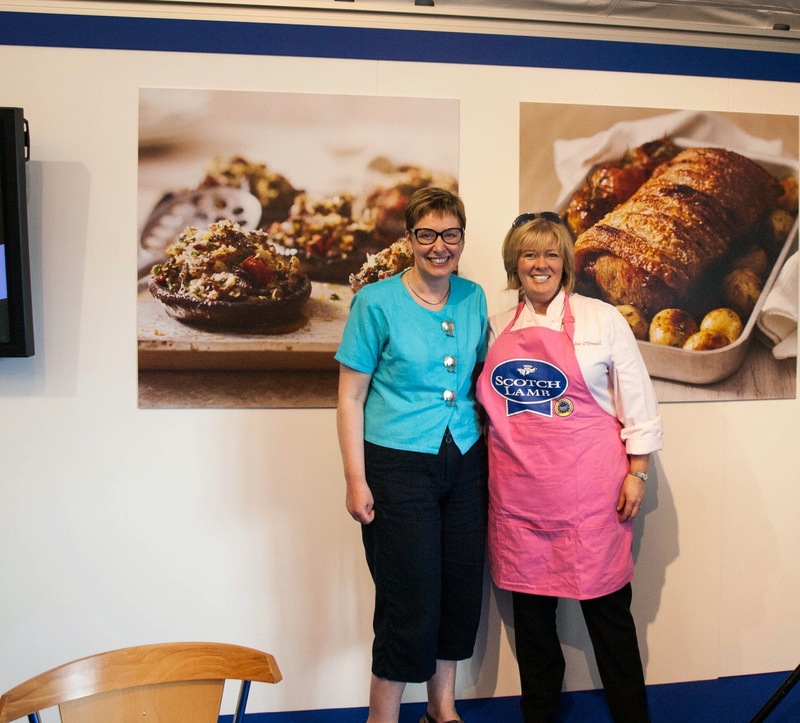 I then had the opportunity to meet up and chat with Jacqueline O'Donnell, who is just as warm and friendly as she appeared on The Great British Menu. 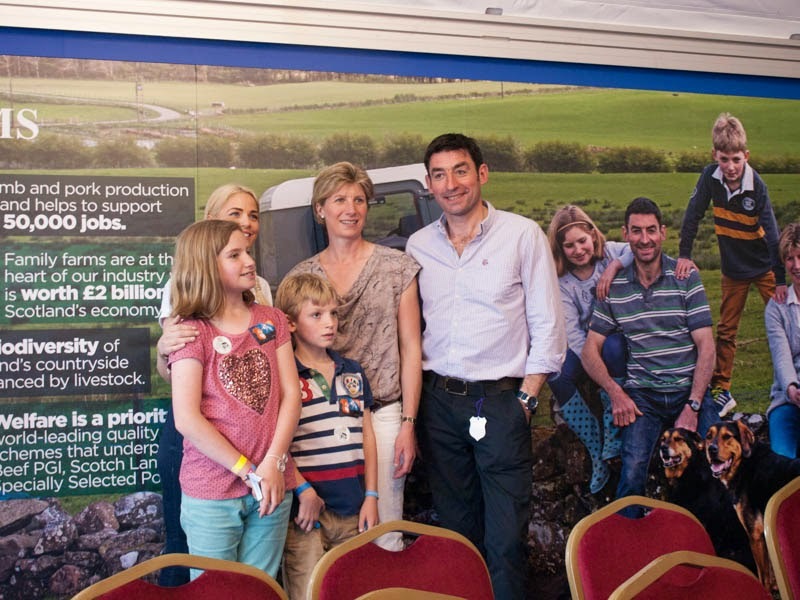 After chatting for a while, Jac went off to prepare for her demonstration and I had the chance to meet the Dykes family from the Scottish Borders, who opened up their farm to BBC Lambing Live, are members of QMS and had been taking part in a Question and Answer session for visitors to the Highland Show. 1.5g braising Scotch Beef PGI, preferably 2 large beef cheeks, trimmed and halved. Heat the oven to 140C. Heat the oil in a large oven proof casserole then spend a good 10 minutes browning the meat well on all sides. Scatter the vegetables, thyme, coriander seeds and close in amongst the meat and continue to cook over a high heat for 10 minutes until browned. Pour over the sherry vinegar, soy sauce and Madeira and drizzle over the honey. Stir everything together, then reduce over a high heat until it's sticky and syrupy and the meat is coated really well. Stir in the tomato puree. Pour over the stock and bring to the simmer. Stir, then taste and lightly season with salt accordingly (it may not need any as the soy is already salty). Cover the pan and place in the oven for 2 1/2 to 3 hours, stirring once or twice, until the meat is really tender (or place in a slow cooker/crockpot and cook on low for 8-10 hours or High for 4-6 hours). Remove the meat to another pan or container. Boil the sauce for 10 minutes until sticky, then strain it over the meat. About 20 minutes before serving. drizzle the bok choi with half the oil and the soy sauce and dust with the icing sugar, Grate over a little of the ginger, then toss well until completely coated. Heat the remaining oil in a large frying pan, add the bok choi and cook until the sugar coating starts to caramelise. Pour in the stock and simmer for 5 minutes until tender. Reheat the beef, you are now ready to serve. Lift the meat out of the sauce and carve into thick slices. Place a large spoonful of mash on the side of each plate. Lay a few slices of meat on the mash. Sit two bok choi quarters on the other side of the plate and spoon over the sauce. I was fortunate to get a few bits and pieces from the Davidsons demo including this Pork Loin Tower which I stretched to feed three of us, it would certainly feed two comfortably. 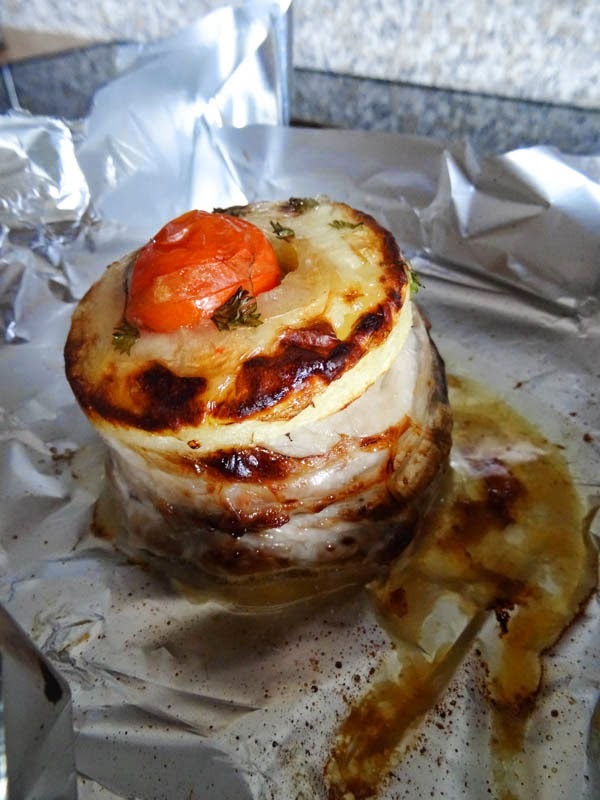 We really enjoyed it and it was simple to roast in the oven. Each day of the Highland Show includes the Grand Parade. 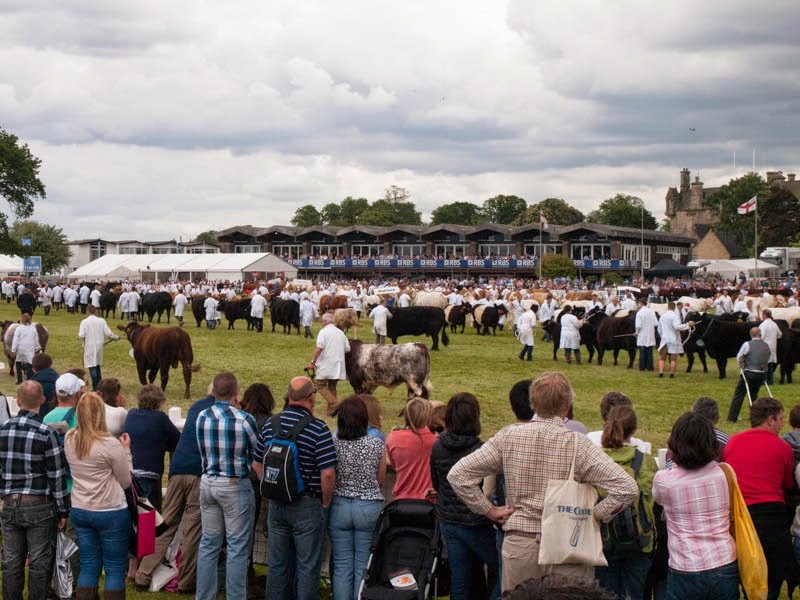 All of the cattle, sheep, goats and horses are paraded in the main ring, it's quite a sight and I had a an excellent view from the QMS marquee. 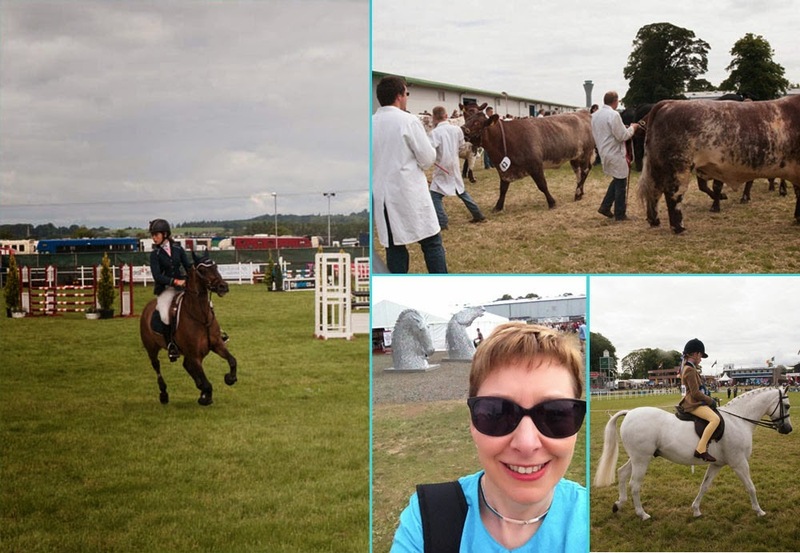 Many thanks to all at QMS for looking after me so well at the Royal Highland Show, to Jacqueline O'Donnell, Jock Gibson and John Davidson for their time and interest. I was not paid for this post and all opinions are my own. Glad you enjoyed my virtual show, Dom. The food Jac made would have been right up your street! Never mind, you can't do everything and let's face it, you had a MUCH better offer! Well I'm glad to hear that Belties are popular in Italy, they are slow growing and live outside all year round makes for much better meat. Obviously I spotted the Suffolks as soon as I started looking at your pictures. Obviously. I missed the Suffolk Show this year. The recipe looks nice and easy and flavourful too. On my June Kitchen Table: Super Speedy Eats!